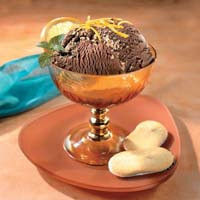 Crushed Pepperidge Farm® Orange Milano Cookies are combined with bourbon and chocolate ice cream, then the mixture is frozen making a cool and refreshingly good dessert. HEAT bourbon in saucepan to a boil. Cook over low heat 3 min. Let cool. MIX ice cream, crushed cookies and bourbon in medium bowl. FREEZE 45 min. or until firm. Scoop into dessert dishes. Garnish with orange slices, orange zest, mint and whole cookies, if desired. Substitute orange juice for bourbon. Recipe may be doubled. This entry was posted on 6:24 PM and is filed under Desserts . You can follow any responses to this entry through the RSS 2.0 feed. You can leave a response, or trackback from your own site.